Part of the fun of designing with the ATtiny85 and ATtiny84 ranges is trying to shoehorn your project into the tiny package. I'm sure I'm not the first person who has run out of I/O pins while trying to use one for a project. Here are some tips I've discovered for making better use of the existing pins, or finding an extra pin. How many inputs do you need to use to sense n pushbuttons? The simplest method is to connect each pushbutton to a separate input. This requires n inputs. For more than four pushbuttons it is better to arrange the pushbuttons into a x by y matrix, and multiplex them. This requires x+y inputs, so for 16 pushbuttons you need 8 inputs, or for n pushbuttons you need about root n inputs. Connecting five pushbuttons to a single input. The 1kΩ resistors form a voltage divider, giving outputs of 0V, 1V, 2V, 3V, and 4V. With no button pressed the analogue input A0 is floating, so the internal pullup resistor should be enabled. Pressing a button sets A0 to the corresponding voltage. which returns a number between 0 and 5. 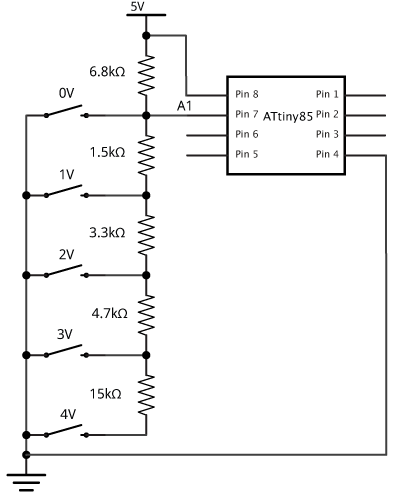 Using a pin as both an input and an output. Set the output low when you want to turn on the LED. Program it as an input when you want to turn off the LED, or read the pushbutton. You shouldn't set the output high since the pushbutton could then short the output to ground; to protect against this connect a second 220Ω resistor in series with the switch. The only limitation is that the LED lights up while the pushbutton is pressed, but if the LED is showing the status of an option selected by the pushbutton that may actually be appropriate. As is well known you can reprogram the internal fuses to reclaim the reset pin as an extra I/O pin. 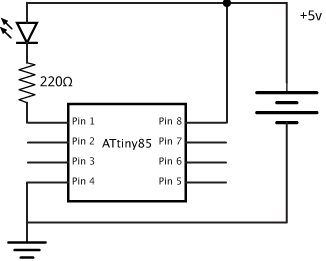 What is less well-known is that you can actually use the reset pin in a limited way on the ATtiny85 without having to reprogram the fuses, provide you avoid taking it below about 2.5V which will reset the chip. To reveal the ADC reading I've connected a piezo speaker between PB3 and ground, and I'm using a simple debug routine which beeps out the ten-bit ADC value as a series of low and high beeps, LSB first, with a low beep representing a 0 and a high beep representing a 1. This corresponds to the datasheet, and gives us a range of 2.8V over which we can use the reset pin for analogue measurements. 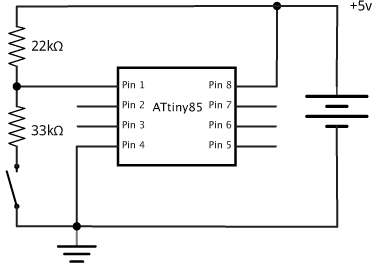 Using the reset pin on the ATtiny85. Reprogramming the fuses to use the ATtiny85 reset pin as an I/O pin. The problem is that once you have done that you will no longer be able to upload a program using an ISP programmer without first resetting the fuses using a high voltage programmer. To program the ATtiny85 I used Sparkfun's Tiny AVR Programmer . 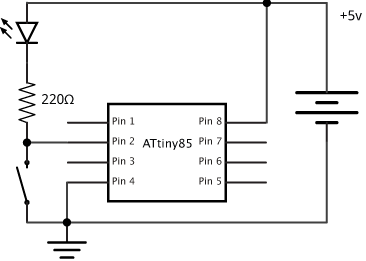 To use this with the Arduino IDE install the ATtiny microcontroller support for the Arduino IDE. You now need to reprogram the High Fuses to 0x5f rather than 0xdf, to set the RSTDISBL fuse. and run the program to set the RSTDISBL fuse. Now if you put the ATtiny85 back in the circuit the LED connected to pin 1, the reset pin, should flash as required. Note that the reset pin doesn't have such a high drive capability as the other pins, so the LED will be dimmer than an LED on pins 0 to 4. You will need to reset the fuses to their default values using the High-Voltage Programmer again before proceeding. 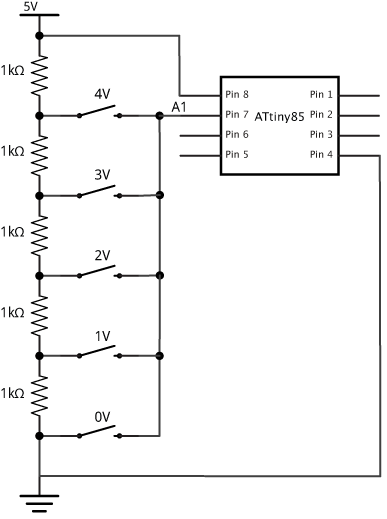 ^ ATtiny Fuse Reset on Wayne's Tinkering Page.